French Emblems: Emblem: Dum potes vive. Ad Achillem Bochium, tanquàm parentem, de sepia. 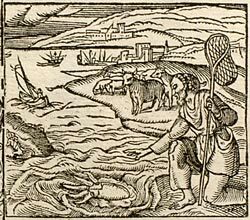 For Achille Bocchi, as a father, about the cuttle-fish. Decipio effuso prompta liquore manus. Atramenta vetant, abdita tuta nato. Cur non effugiunt, seque tuentur ope? Nos vocet, ac tenebras mutet honore graves. In vitam, supera quod datur arce, tibi. Se induit, atque alias iniicit usque moras. Ingenii nobis des monimenta tui. While he is hunting me, the greedy fisherman follows me, when I’m visible, I deceive the hands by pouring out fluid. Dark waters conceal me, black pigments prevent to see me, the covered fish, and I swim safe and hidden. Thus, why do those who have the capabilities to defend their lifes, not flee and protect themselves with that power? Until He calls us, who sent this soul down from heaven, and replaces the heavy darkness with honour. A premature death offends God, you have no power over life which is given from the high citadel. The octopus escapes by putting on different colours on stones and takes on different throws in different obstacles all the time. You, who have achieved and can do so much, give us willingly the monuments of your talent. 1. Achille Bocchi, a contemporary emblematist (d. 1562).